When I met Christy Vega Fowler at Casa Vega, she and her sister were prepping to host a day of filming for Quentin Tarantino’s new Manson-era movie, “Once Upon a Time in Hollywood.” The director is taking great pains to stay true to the look and feel of L.A. in the late ’60s. In the case of her family’s restaurant, necessary changes were minimal, since the wood bar, sumptuous red booths and even servers’ uniforms have stayed classic. Her father Rafael “Ray” Vega’s original vision for the Mexican restaurant has veered little since 1956, other than one move, and has become a Sherman Oaks mainstay. Rafael Vega grew up in the restaurant world, with his parents running Café Caliente for 18 years on downtown’s historic Olvera Street. Relocation to Hollywood & Vine did not work out as planned. Vega Fowler continues her family’s saga, saying, “Many Mexican restaurants at the time did not work beyond Olvera Street, so that did no go well. My dad dropped out of college to support his parents and was selling life insurance. A lady knew him from Olvera Street and said, ‘I have a location in Sherman Oaks and want you guys to open there.’” Three months of free rent convinced him to open Casa Vega. Ray Vega’s daughter Christy Vega Fowler now helms the family-run business. She figures it was a given that she’d work with her father in some capacity. His property rental and food distribution companies were both options, but she fell for the restaurant. “I wanted to go to culinary school, but my dad said the culinary school training could be after you earn your business degree,” she says. “You have to learn how to keep the restaurant open and manage the P&L.” She majored in Business at Saint Mary’s College. Vega Fowler is business minded, but develops recipes for seasonal menus. 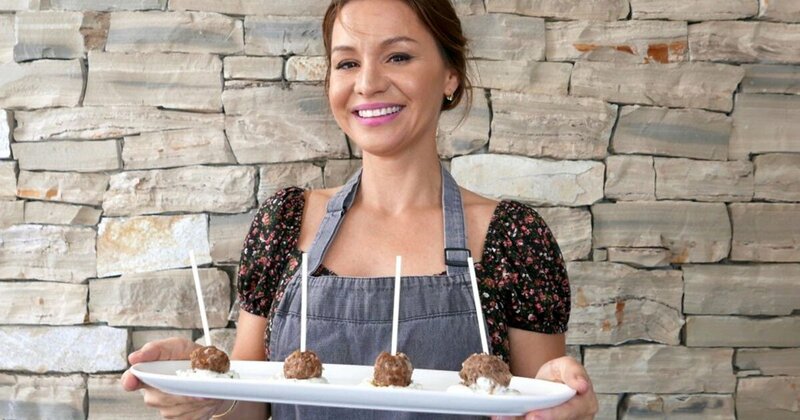 For instance, albondigas lollipops have become popular for catering and special events. This dish is a play on albondigas soup, her great grandmother’s recipe, first served at Café Caliente. Casa Vega’s albondigas is a signature soup co-starring carrots, potatoes, and celery in a house-made chicken broth. Lollipops are skewered instead of served bobbing in soup. In this version, Vega Fowler mixes Laura’s Lean Beef with white onion, ground pepper, garlic powder, green onions, one egg, and rice by hand for full integration. Vega Fowler rolls one-ounce meatballs before dropping them in boiling chicken broth. Five minutes after the soup reaches a second boil, albondigas are fully cooked. Remove the meatballs, and once they feel cool to the touch, they’re ready for lollipop sticks. During the meatball cooking process, create the yogurt sauce by combining yogurt with heavy cream to make a Mexican crema. Vega Fowler suggests FAGE Total 2% plain Greek yogurt. Add chopped cilantro, Kosher salt, and black pepper to taste. Plant each skewered meatball stick-up in a dollop of yogurt sauce and serve on a plate. Vega Fowler may have become better known for crunching numbers and for warm hospitality, but albondigas lollipops prove she can still throw down in the kitchen. - In a large bowl, add ground beef along with the onion, green onion, egg, black pepper garlic powder and rice. - Mix together with your hands. To form meatballs, take a 1 oz of meat and roll into balls with your hand. - In a large pot, bring broth/water to a boil and then add meatballs. - Bring broth back to a boil after all the meatballs have been added and boil for an additional 5-10 minutes. - Remove meatball from broth. Set aside until cool enough to handle and then gently insert lollipop stick in center of meatball. - Next make the Cilantro Yogurt Dipping Sauce, combine yogurt, cream, cilantro, salt and pepper in a medium bowl and mix together. - To serve: add a teaspoon of Cilantro Crema Dipping Sauce to bottom of dish and place the Albondigas Lollipop directly on the sauce.